Do you have a vast yard that frequently needs maintaining? Or are you a professional looking to buy a comfortable and well-priced mower for your daily tasks? Well, if your response to any of the above questions was yes, then you’ve come to the right place. After getting some excellent feedback from a few of my employees, I decided to try out the Swisher ZT2760B. And I must say, I’ve had quite a positive experience after spending two weeks with this product. But it wasn’t all sunshine and rainbows. Now, it’s time to find out if the Swisher ZT2760B can be your next purchase. Swisher Zero Turn Mower Review 2019: Why can the ZT2760B be your pick too? What can Swisher improve in the ZT2760B? Here are some of the reasons why I find Swisher ZT2760B to be a great choice. In my opinion, the ideal riding lawn mower is like the ultimate fusion between a bodybuilder and a ballet dancer. What I mean by that is, it must have the raw strength and power of a bodybuilder, while also being nimble like a skilled dancer. And the Swisher ZT2760B doesn’t disappoint in both these aspects. After a short test run in my front lawn, I felt the ZT2760B’s 27 HP engine is sufficiently powerful and fast. Sure, the 6 MPH maximum speed may not be the highest I’ve tested, but it’s more than sufficient for trimming a large area. As for the maneuverability, the Swisher ZT2760B is just as good as any of the zero-turn mowers I’ve reviewed earlier. In fact, I was quite surprised by the way this mower handles, especially since its underwhelming industrial design makes you think otherwise. Now, as I continued testing the ZT2760B in my front lawn, it quickly grew on me. I was quite surprised to find that this mower is just as fast in the reverse gear. That, along with its relatively light weight build surely makes it one of the most maneuverable riding mowers I’ve come across. Now, I’ve tested many riding lawn mowers, but none have a cutting deck quite as wide as this one, especially in this price range. The ZT2760B’s deck is 60 inches wide! And the wide cutting deck is complemented well by the three mulching blades, which are made from tough 11 gauge welded steel. After the initial test run, I took the ZT2760B out to prepare a local soccer field. And that’s where it really shone. The large cutting deck and powerful engine made the task quite simple. In fact, I was done with the task in less than two hours! Quite impressive, right? However, the ZT2760B’s strength is also its Achilles heel. In fact, due to its wide size, I couldn’t squeeze it between two trees in my front lawn. But I can let that slide. After all, a riding mower is meant for large areas. Moreover, I’ve seen quite a few competitor products with narrower cutting decks and wider bodies. Grass isn’t like hair; you can’t just shave it off and hope everything will be alright. In fact, shaving off your entire head will surely not be the end of the world, but if you follow the same practice for your lawn and cut the grass shorter than 1/3 of its height, it can very well spell disaster. And so, you need a mower which offers versatile cutting options. In this case, the Swisher ZT2760B once again impresses. In fact, it comes with 8 height options ranging from 1.5 inches and going up to 5 inches. Although many might feel that it’s an overkill, I beg to differ. There’s no such thing as too many adjustment options for the perfectionists. Now, for adjusting the height, Swisher has kept things simple. You can simply raise or lower the deck using the spring-loaded manual lift. But, that’s not the best part. Not even close. What I really love about the ZT2760B is the anti-scalping wheels. And how exactly does that help? Well, this feature ensures that you don’t accidentally cut the grass too short, especially while traversing over rough ground. I thoroughly tested this feature in my front lawn, and I must say, it works quite well. Riding mowers are serious machines for serious professionals. And oftentimes, people like me have to do our jobs for many hours at a stretch. So, as you might have guessed, comfort is really important. How does the Swisher ZT2760B fare in the comfort department? Well, in my opinion, this is surely one of the most comfortable riding mowers I’ve tested. The seat is foam padded and offers reasonable lumber support. But what steals the show are the adjustable 6 inches armrests. You can slide them forward to ensure a comfortable grip on the steering levers. Nothing is perfect, and the ZT2760B is far from it. So, here are some of the areas I hope Swisher works on. ZT2760B’s biggest weakness is sloping areas. You just can’t maneuver it on steep slopes. Now, bear in mind, I’ve used other mowers which have handled much better in similar conditions. Another glaring cons of this mower is the sheer amount of maintenance needed. The mower belts need to be changed quite frequently. Much more so than competitors. The ZT2760B doesn’t let you bag grass clippings, and if you’re looking for a mower with that very feature, I suggest you look elsewhere. The customer service is just not up to the level of competitors. I couldn’t get much help on a minor technical difficulty despite a 30-minute long call. Why does the mower perform fine uphill but lacks control while going downhill? While going downhill, you’ll naturally use the control arms to decrease the speed. However, doing that will also reduce the fluid flow to the servos, and as a result, you’ll lose control. The ZT2760B measures in at 70.1 x 60.3 x 31.9 inches, and weighs 598 lbs. What is the deck belt size for the ZT2760B? 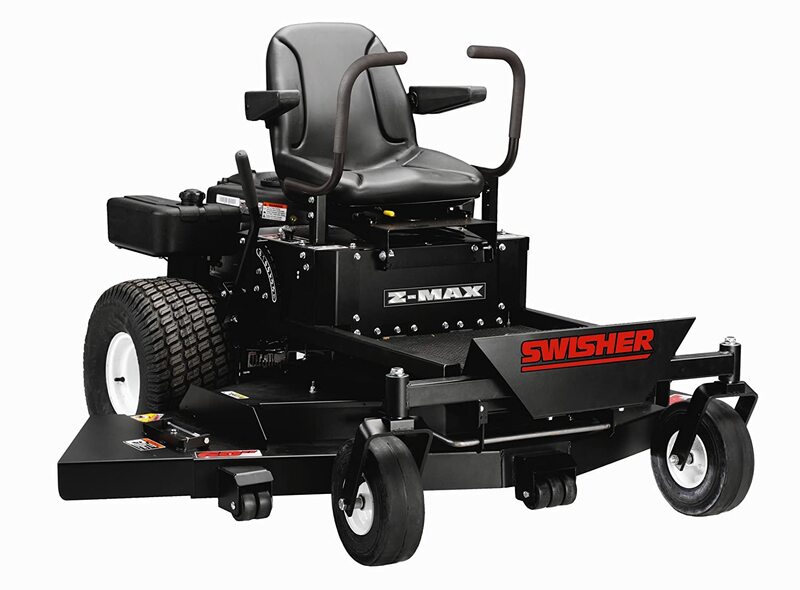 The Swisher 122 inches belt is the ideal fit for this mower. Swisher offers a 2-year warranty on the product. All in all, the Swisher ZT2760B is a wonderful product, especially if your work revolves around mowing relatively flat areas. Moreover, it offers good value for money. However, if you’re not technically adept, I wouldn’t suggest buying this product as it requires a fair bit of maintenance.